Beginning in the 1970s confined animal feeding practices and increased meat consumption among people were promoted in order to expand the market for grain and prevent grain prices from falling. A similar strategy is in use today to further increase demand for grains – but instead of feeding animals and people, the international agribusiness sector is courting the virtually unlimited appetite of the automobile by promoting grain-based ethanol production for use as fuel. Both intensive livestock production and biofuels are products of the industrialization and corporatization of agriculture. The profitability of ethanol plants depends on not only government subsidies and the price of corn and natural gas, but also the ability to sell their number one byproduct – wet or dried distillers grains (DDGS or DG -- also known as spent mash). The market for this byproduct is the intensive livestock industry – cattle feedlots and intensive hog operations. The expansion of ethanol production in North America has also been a factor in driving up the price of food and feed due to increased demand for corn. The high prices make it harder for small scale livestock producers to stay in business, leading to ever greater concentrations of meat production at factory farms. Beyond Factory Farming is a frequent contributor to the public debate on biofuels. We submitted a brief on Bill C-33, the Act that permits the federal government to create mandatory biofuel content regulations to the Standing Committee of Parliament, and we submitted comments during the Canadian Food Inspection Agency’s policy consultations on ethanol waste as livestock feed. 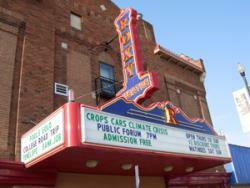 In April 2008 Beyond Factory Farming co-sponsored the national speaking tour, Crops, Cars and the Climate Crisis dealing with agricultural biofuels, human rights and food sovereignty.